Performers include: Blair Underwood, Michael Warren, Hill Harper, Phil Buckman, Viola Davis, T.E. Russel, Maya Rudolph, Robert Morse, Vivica A. Fox, Tamara Taylor, Kyle Secor, Gabrielle Union, Harold Sylvester, Forest Robin, Mari Weiss, Gregg Daniel, Charles Emmett, Lawrence LeJohn, Jeremiah Birkett, Octavia Spencer, Nicole Bush, Ron Canada, Sandy Shultz, Gregory Alan Williams, Niecy Nash, Beau Billingslea, Diana-Maria Riva, Robert Foxworth, Paul Moncrief, Bokeem Woodbine, Ron Taylor, Marshall Manesh, L. Scott Caldwell, Manny Kleinmuntz, Tzi Ma, Billy Mayo, Paula Newsome, James Pickens Jr, Tony Plana, LaRita Shelby, and Shannon Whirry. 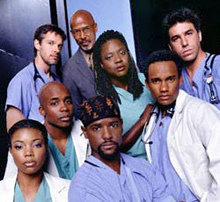 A drama that focuses on the doctors and nurses who work at the struggling Angels of Mercy Hospital in the inner city of Los Angeles. Dr. Ben Turner (Blair Underwood) is the hospitals’ acting chief of surgery who is devoted to his patients and the community. He reports to his former lover, recently hired medical director Dr. Lillian Price (Vivica A. Fox). Her decisions are frequently scrutinized by the hospital’s CEO, Ron Harris (Michael Warren), and Edwin O’Malley (Robert Morse), the facility’s powerful chairman of the board. Medical residents include jaded Dr. Wesley Williams (Hill Harper), inexperienced and affable Dr. Geoffrey Weiss (Phil Buckman), and long-term resident Dr. Arthur Jackson (T.E. Russell). Support staffmembers include attractive Nurse Grace Patterson (Maya Rudolph) and veteran surgical nurse Nurse Lynnette Peeler (Viola Davis). When Dr. Price leaves, she is replaced with by-the-book Dr. Nate Ambrose (Gregory Alan Williams). Nurse Patterson also leaves and the staff is joined by young plastic surgeon Dr. Raleigh Stewart (Kyle Secor) and new resident Dr. Courtney Ellis (Gabrielle Union). Jeff what else should we say in our letter we need everyone attention to get City of Angels back on YouTube let’s try CBS and see if they have all twenty four episodes. I emailed the CBS letter to you. Jeff what else do we need to do now anything else that we need to put in our letter what should we say we also need to make sure that people can help us get city of Angels back on YouTube what else do we need to do now since we have the draft .